I wanted to add some extra detail based on discussion with heyjoe, and noticed this tut didn't have it's image links fixed. I've got these images by emulating the silent picture module on top of the 60D firmware, using the above CR2 as reference image. EOSM/700D/650D/100D were a little stubborn; the 60D has the same resolution, but different offsets, so the screenshot might be off by a few pixels. This method uses our own preview (so that one won't match exactly what you have seen on the screen, as the previews on regular image capture are rendered by Canon's image processor - a black box for us) but the raw overlays are the same as with a regular image capture (not yet emulated). So, I expect the raw overlays to be the same as on the real camera (maybe off by a few pixels because of different offsets). Notice the solid areas in the last two runs (both with crop_rec_4k's raw backend) are overlapping very well - the solid zebras on the unprocessed dual iso image (what you'd get when capturing a dual iso image) correctly predicted the overexposure from the end result (after processing with cr2hdr). Were the raw overlays different on the camera screen? Can you provide a screenshot? Slightly different composition, but I can't see the diagonal shading. 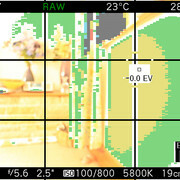 In photo mode, dual iso is only enabled outside LiveView (that is, when reviewing the captured image). Reviewed the image and not that informative on an EOSM. I still don't get it - are the raw zebras on EOS M different from the ones in the above emulation? If yes, can you provide a CR2 and a screenshot? I simply don't see the diagonal lines. The screenshot should not be in LiveView; it should show ML overlays right after taking a picture. Easiest way to take it: set Image Review to Hold in Canon menu, activate the Screenshot function in ML menu (to trigger after 10 seconds), then take a picture. Not sure how to time taking a non LV review shot. Step 1: Canon menu, Image Review - set to Hold. Step 2: ML menu, enable Debug -> Screenshot (10s). Step 3: Press the shutter button to take a picture. The camera should show the image you have just taken (not the LiveView screen). That image should be stationary (should no longer move as you move the camera). Wait until the screenshot is taken; do not press anything to return to LiveView. Step 4: Press half-shutter (or other key?) to return to LiveView. IIRC, you have a 5D3 and an EOS M to try. I only have the former. Is the behavior different between the two models? If that's still not clear - can you record a video of the camera screen? I'm not going to waste anymore of your time, including uploading anymore images. As I said before, for me, I can't see much use for the zebras, other than providing extra spacial info regarding clipping, ie where in the scene. Which I can see in LV. Bottom line: as usual, , I fear my 'reporting' was a reflection of my ignorance.